On May 15, 2008, the polar bear was listed as threatened throughout its range under the Endangered Species Act (ESA). It was assigned this designation due to the fact that is likely to become endangered in the future. The sea ice habitat utilized by polar bears is declining throughout the species’ range and likely to continue declining in the future. 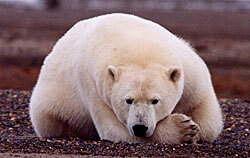 For general information on Polar Bear, see the Polar Bear species profile page.